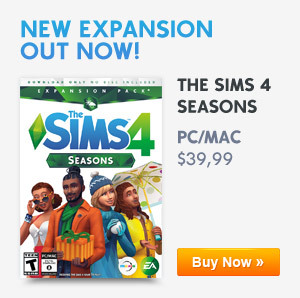 The Detective Career is one of the 3 active careers in The Sims 4 Get to Work Expansion Pack. The Police Station is at the center of this career. You will start there to pick up new cases, interrogate suspects and work with follow officers to solves crimes. You will start as a Cadet but you can climb your way up to become the Chief of Police. By leveling up the Detective career you will unlock a lot of Buy Mode objects like chairs, sofa’s and even a bed. Go to the Police station when called into work. You will have the option to join your Sim on their workday or manage your Sims at home. The Police Station is the main hub for police and detective activity. There are holding cells to lock up criminals, booking areas to process suspects, and interrogation rooms to get a confession. There is also a crime lab which is used to gather and analyze clues. And the office area where Sims push paperwork. You can’t get near the Police Station when you aren’t on the job. Start your Workday at the Police Station. Solve criminal cases, small cases or patrol the streets to solve minor crimes. Start your workday by being Happy or better by being Focused. You can do this by browsing Simpedia on the Computer at home to gain a +1 Focused moodlet for 4 hours. You can also use cheats to gain a +2 Focused moodlet for 12 hours. Learn and level up the Logic Skill to get a better result if you are analyzing samples on the Chemical Analyzer. Learn and level up the Handiness Skill in case equipment breaks down. You can also use it to upgrade the Chemical Analyzer for better results. When you start your job at the Police Station you will get a case assigned. To solve this crime you need to start at the Crime Map inside the Police Station. You will have to go to the crime scene within the neighborhood to look for evidence and clues. All the evidence you find will be placed in your inventory. Clues from crime scenes can be Analyzed at the Chemical Analyzer inside the Police Station. Analyzing evidence from the Crime Scene allows you to discover clues about the suspect. Hang all your clues on the Crime Map and connect the dots. Tip: Use the Computer to Cross Reference Photos or Witness Reports. You might find pertinent information for your case. If you gathered a lot of clues from various sources you will be able to arrest the suspect. Find and Arrest a suspect that fits the clues in your Notebook (you can find the notebook on your phone, top left icon). It will show you numerous of things to identify the suspect like traits, gender, clothing or age. Not all the clues are correct, that’s why you want to collect as much clues as possible from the crime scene. When you get the option to Issue APB, you will be send to a public location where the suspect is said to be. Ask other Sim around to point you in the right direction. Some of these people are also witnesses so they may even point out new clues or correcting wrong ones. If you think you got the right suspect, arrest the Sim! If you think you found the right Sim you can take them to the Police Station. You’ll have to take a mugshot, search the Sim and collect fingerprints. Now you can take the suspect to the interrogation table. Use interrogation actions on the suspect until you are able to determine whether they are guilty or innocent. You can use different techniques to confess their crime. You can play the role of good cop, bad cop or lay out clues. After the Sim confessed you can close the case and lock the criminal behind bars with the rest of the scum. While your Sims is working as a Detective you can Go on Patrol. Go On Patrol interaction can be found on the Police Desk, Crime Map, and when clicking in a “travel region” in the open street. Patrol the streets to improve community relationships and issue citations. While leveling up in the Detective career you will be able to get a few rewards for your hard work. I can’t even get my sim to go to crime scene or patrol…but they can assign themself a case and start piecing things together on the corkboard…very frustrating. Has anyone figured out the trick to interrogation? Like which questions should be asked based on the emotions of the suspect? It seems like a tricky system to figure out…. what ive been doing is showing evidence to the suspect and be a bad cop if they are tense , but with shy suspects the bad cop role douse not work so be a good cop, i normally get confession quickly by using glare coldly and ignore plus intimidate them actions seem to always work for me . try them out and tell me how it went. Thanks Don Lathario will be happy to know this he has been struggling! 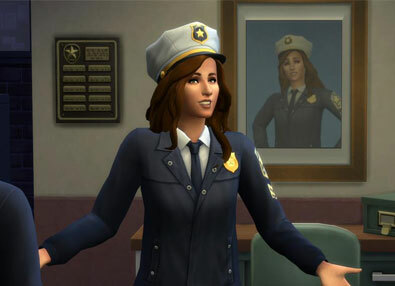 My sim is the chief but other lower ranking sims (officers and such) keep on going into the office and using the computer and won’t seem to leave, is this just a part of the game? I never remember this happening when the system spawned chief was there. If you have a tough time with interrogation.. I do this.. It works very well for my Detective :3 might not be the case for yours but it does work for me. I’m a level 4 Detective and I’m on this case I’ve took all the photo’s, collected evidence, dusted for print’s and built my case by analysing & cross referencing. I’ve gotten several clue’s and sent out an APB. But no one is showing up matching all the suspect’s description’s on my note pad, I’ve attempted this 4 times now an even tried to arrest 2 old lady’s that were only one off matching the description and lost job progress. I’m I missing something ? Please Help ! So, I kneknew rebuilding the station could create problems. But I have plenty of computers. My problem is none of them will cross reference anything? I even binned the stuff I had and got new evidence. The option is just greyed out no matter which computer I try. My ex roommate keeps breaking into my house. The police said to get her on camera which I think I have. How do I approach a detective to quickly put her in jail? It is a terrible stress. How do you dismiss a case? I found it before, but I cant find it now! I have all six clues, but I keep falsely arresting, even though they match the description. Please help!